Rating: Average 4.26 / 5 out of 39 total votes. Summary: It's not easy to become and live as a mangaka, as Mashiro knows from his late uncle. At his 9th grade, while trying to keep up with reality, school and then normal job, he left his notebook with a sketch of Azuki, a girl he likes. Takagi, a first rate student found it and trying to convince Mashiro to draw a manga with his story. Mashiro doesn't like the idea and tries to decline. Takagi, however, tries to stick to dream and found out that Azuki also wants to be a voice actress and already got a good reply from a production company. Takagi, then, brought Mashiro to her house and telling her his dream.... Mashiro then tells her that he will write a manga with Takagi and if their manga gets turned into an anime, she'll voice the female lead and marry him. Azuki agrees, but the condition that she has is that they cannot meet until then. Now, the lives of wannabe mangakas begin!!! 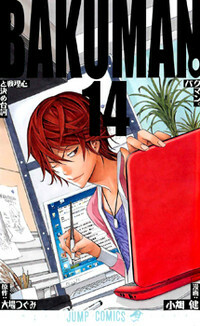 Nominated for the 3rd Manga Taisho Award (2010).